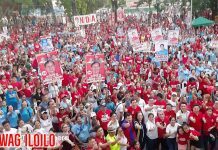 Former Philippine National Police chief Ronald “Bato” dela Rosa, incumbent Sen. JV Ejercito and leading congressional candidate Julienne “Jam-Jam” Baronda have great plans for the development of Iloilo City. With them in the photo is Councilor Love Baronda (rightmost). ILOILO City – Elated with the warm welcome they got from Ilonggos, two senatorial candidates – Ronald “Bato” dela Rosa and incumbent Sen. JV Ejercito – vowed to help leading congressional candidate Julienne “Jam-Jam” Baronda realize legislation and projects to benefit this city should all three of them triumph in the May 13 midterm polls. Dela Rosa, who knew Baronda even before he became the Philippine National Police (PNP) chief then, said he has seen how she worked hard in the Senate and helped the PNP push its programs so he has all the reasons to help her especially in her quest to bring peace and order in Iloilo City. 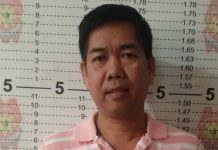 “Nakatrabaho ko talaga si Jam-Jam sa Senado kasi siya ang kausap naming pagnagpapa-aprub kami ng budget ng PNP at kung ano pang mga programa. Nakita ko ang dedication niya at pangarap niya para sa Iloilo. 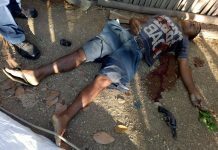 Kaya 101 percent akong tutulong sa kanya,” dela Rosa said while vowing to put out crimes from the communities and crush down illegal drugs. It was Baronda who would discuss clarifications with Dela Rosa and would brief Sen. Ejercito before the latter defended the then-proposed budget of the Interior department, under which PNP belongs, that included its purchase of brand new choppers because he was the vice chair of the Senate finance committee. Dela Rosa knows the aspirations of the poor and he wants to champion these in the Senate coming from poverty himself. His family was “dirt poor” as his father earned little money working as a tricycle driver. Dela Rosa worked as a fish market porter and bus conductor and used to walk 8 kilometers daily from school to home. 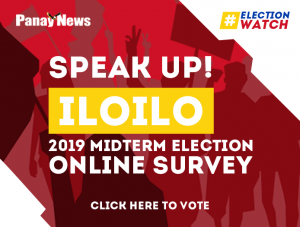 Former police chief dela Rosa, meanwhile, shared a boodle fight with the two at the Iloilo Central Market, where they were mobbed by vendors and ordinary citizens. Coun. Love Baronda was also with them. If reelected, Ejercito – known as “Mr. Healthcare” – said he will ensure that the WVMC Heart and Lung Center and the WVSUMC Heart, Lung and Kidney Institute will be completed as he will work with Baronda, his chief political officer, to facilitate funding for the projects’ second phase. “I want that each region with have a specialty hospital so that Filipinos would not go to Manila anymore for your heart surgeries or organ transplantation procedures. I will help get the additional funding to get these projects completed. 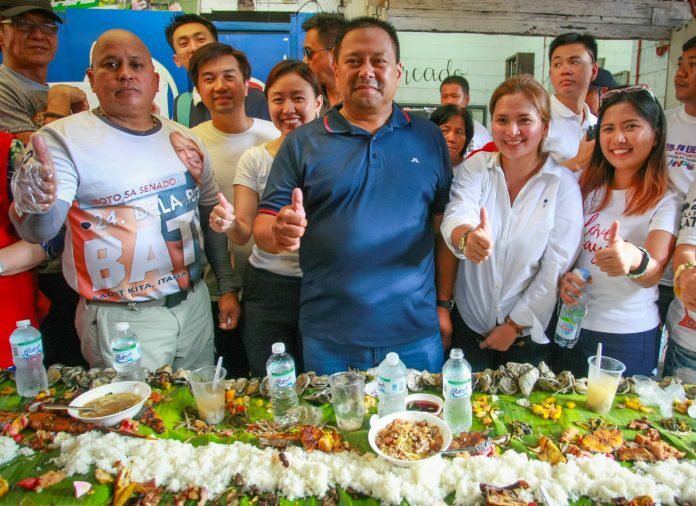 And that would be done more easily if you make Jam-Jam Baronda your congresswoman and you re-elect me so we can work in tandem,” Ejercito, who chairs the Senate health committee, said. Baronda said that her “H.O.P.E” platform of government, which stands for health, obra (work), peace and order, and education programs, will be easier to realize because she will have counterparts in the Senate who will push her agenda especially on health and peace and order. “Sen. JV and Gen. Bato will be my champions in the Senate because whatever I propose in the Lower House will now have counterpart bills in the Upper House. It would be easier that way because bills have to be approved by each house of Congress for it to become a law,” Baronda said. Ejercito, meanwhile, admitted that Iloilo City has a special place in his heart being a son of a native of Molo district, Mayor Guia Gomez of San Juan City. He vows to help the Ilonggos realize other projects such as the Iloilo City People’s Hospital and Senior Citizens’ Center. Baronda served as Chief Political Officer for five years of Sen. Ejercito, where she has learned firsthand the art of lawmaking – from technical procedures to legalities to the human dynamics involved to ensure the legislative measure becomes a law.